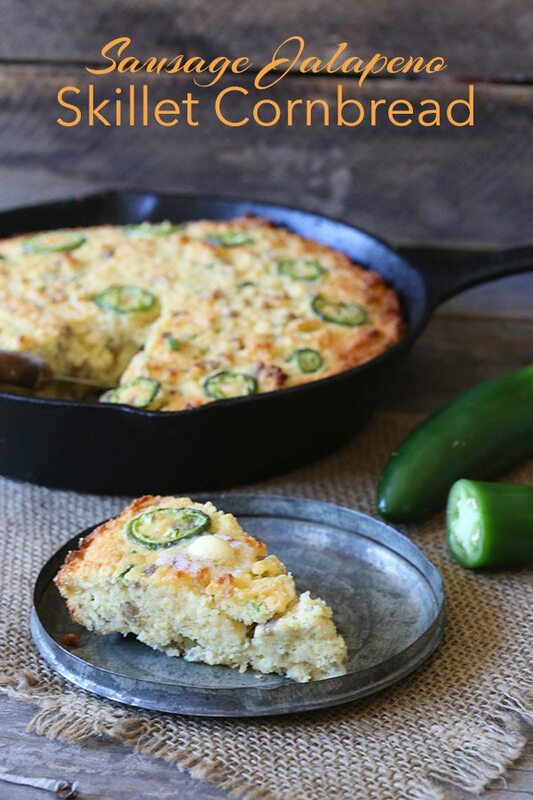 A delicious low carb, grain-free cornbread packed with crumbled sausage and chopped jalapeños. 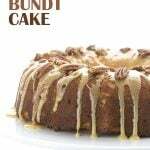 You won’t know it’s made with coconut flour and almond meal! This post is sponsored by Bob’s Red Mill. Of course this isn’t REAL cornbread, at least not in the sense that it has any actual corn in it. Because that would just be cruel, wouldn’t it? To dangle cornbread that was actually made with cornmeal in a community full of people trying to lose weight or control their blood sugars, and who may have loved real cornbread back in the day? That would be cruel and unusual punishment and I could never forgive myself. I promise I would never do that to you. But let’s tackle the word “real” for a moment. People bandy about this word a lot these days, particularly in the healthy food community. And you have to ask yourself, what does “real” really mean? The reality is that it means very different things to very different people and there is no one good definition. The paleo people will give you a very different answer from, say, the whole grain believers. I suppose, like anything in reality, “real food” has more to do with what is real to the individual than to any clearly definable entity that we can all agree on. In my world, “real food” contains ingredients that are actually naturally-occuring. So that would, technically, include wheat and corn and sugar, even if I think these things are not actually good for you. I had a recent experience on Twitter wherein Nigella Lawson and many of her followers made fun of my low carb “banana-less” banana bread recipe. It ignited a bit of a firestorm, actually, with some righteous indignation on both sides (although not on my own behalf, because I thought the whole thing was highly amusing). There was a lot of “Oh, ew, why would you do this?” and many accusations that it wasn’t REAL food. But everything in the recipe was, in fact, real: the almond flour, the chia seeds, even the natural banana flavouring. All pretty real indeed and a far sight healthier than the wheat and sugar-packed variations espoused by Nigella herself. And I would have put my bread up against any of those high carb versions for a taste test…I bet none of those unbelievers would have known it wasn’t their version of “real”. So I declare this “corn-less” cornbread very real indeed. It has REAL ingredients from Bob’s Red Mill, such as coconut flour and almond meal that give it both a similar flavour and texture to “real” cornbread. It also has real eggs, real butter, real sausage and real jalapeño for some seriously REAL flavour. 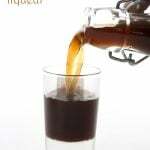 It has no grains and no sugar, nothing to set off the sugar cravings and inflammation and insulin response that the “real” thing might induce. That’s a pretty great version of real, wouldn’t you say? Many thanks to Bob’s Red Mill for sponsoring this post. My work with them helps keep the low carb dream alive! 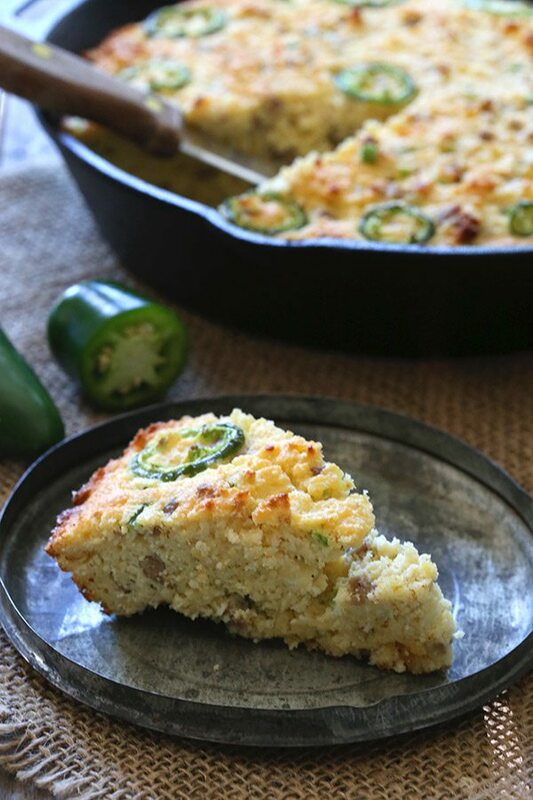 A delicious low carb, grain-free cornbread packed with crumbled sausage and chopped jalapeños. You won't know it's made with coconut flour and almond meal! 3 to 4 jalapeños seeded and chopped (add a bit of the seeds if you want more heat). Preheat oven to 350F and grease a 10-inch oven-proof skillet (it doesn't have to be cast iron, but it helps). In a large bowl, whisk together the coconut flour, almond flour, sweetener, baking powder, xanthan gum, and salt. Stir in eggs, butter, almond milk, vanilla extract, sausage, and jalapeño. Spread batter in prepared skillet and bake 40 to 45 minutes, until edges are golden brown and center is just firm to the touch. Remove and let cool before slicing. Serves 10. Each serving has 4.4 g net carbs. I’m so happy you posted this right before Thanksgiving! I made your stuffing last year. I plan on making it again; maybe, I’ll use this bread as a sub. That would be delicious! This one is very crumbly…a little like real cornbread actually! I made a LC “cornbread” last spring which contained a few of those canned baby-corn-on-the-cob things — they add the true corn flavor and are mostly fibre. Wish i could remember the carb content, but it’s been too long! I love the whole “real” thing. 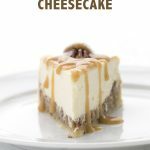 I get so annoyed when someone says a low carb recipe is as good as the “real” thing! This looks wonderful! And since I work at Bob’s Red Mill, I really appreciate the shout out! This looks excellent and like you, I’m a serious Bob’s Red Mill fan. Literally one half of my refrigerator’s top shelf is all BRM products, and has been for many, many years. My family calls it “Bob’s Shelf”. They have supported the low carb community LONG before it became mainstream, and I owe them my deepest gratitude. I’ve found to get a real “corn flavor”, Nature’s Flavors Organic Sweet Corn Flavor Extract is amazing. If you haven’t tried it in low carb “cornbread” recipes or recipes you want to impart a corn flavor layer, I seriously recommend it. It’s reasonably priced and a little goes a long way. I bought mine online. I don’t know if links are permissible, so I won’t add it, but just search the name. Thank you Carolyn for another wonderful recipe!! Thank you Kate for info re: Sweet Corn Extract”. I didn’t know they make such a thing. Is this considered a meal in it self or can it be eaten with a low carb soup! If it wasn’t for you and a few others making these ‘real’ recipies, I would have fallen off the lchf way a long time ago due to boredom. Thank you for taking the time to figure out such delicious ‘real’ recipes. Internet people live to get magnanimous about things they have no stake in. If they don’t have to eat low carb then they won’t want to understand. Your banana bread recipe is amazing. It’s one of my favorite low carb foods (sorry but bacon will always be #1)! This looks really good, and I want it with a soup shooter and a big ol’ greensy salad! Wow, interesting little situation with the whole banana-less banana bread! I love how you incorporate real ingredients in all your recipes, I think a lot of people probably just have no idea. This “cornbread” looks incredible. I wish I was snacking on it right now! 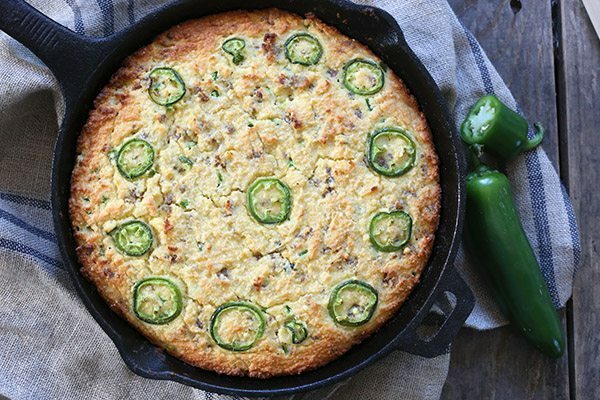 Just looking at the picture of this great cornbread makes my tummy crazy. I always love new recipes. Thanks! To me real food is food I can shove in my face and this NEEDS to be one of those things. 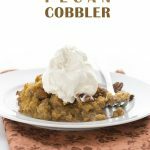 My favorite cornbread stuffing recipe has sausage – and if I just make this I can eat any time!! I could totally eat this for dinner (though I should probably have it with a salad). I can almost smell it baking in my oven. Thanks Carolyn– another winner. I am on a big time savory kick and this just fit the bill. 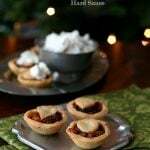 So easy to make and is delicious. I used chicken basil sausage (what I had in hand). And baking in the cast iron pan gives the crunchy edges that I crave. Many thanks! This cornbread looks real to me…REAL good that is! I love your Twitter story, that is awesome! This sounds amazing! 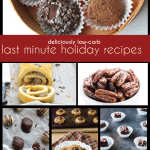 You’re so creative with the low carb recipes! 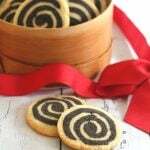 Great article–excited to try this recipe! Love how you responded (or didn’t respond) to the banana-less fiasco. This recipe looks amazing. However I’m allergic to almonds. What do you suggest for a substitute? Try flax seed meal instead. Carolyn, what is your stance on using small amounts of canned baby corn for similar recipes? The carb/sugar amount is low but the fact that it’s still corn worries me. I read somewhere that, ‘all corn is candy corn’. Hi Angelina…my stance is simply that if it fits within your carb counts and doesn’t cause you any health issues, you can do as you like. I don’t see anything like that as entirely off limits. Low carb is such a personal thing. So really, it’s up to you. It’s not like you are going to be doing it all the time and making baby corn a staple in your diet. We made this for an early family Thanksgiving. It was amazing and praised by everyone, and I am the only lowcarber at the table. It’s pretty crazy how the sweetness and texture combine to make it you think it is really corn. I think the next batch will be made without the sugar and serrano peppers. Thanks! MMMM. Had this tonight with your recipe for Broccoli Cheddar soup. Perfect combo! Only had a 12″ skillet and I made the recipe by half again, (IE: 1 cup became 1.5 cups.) Was perfect. Swerve seems to give me a headache for some reason, can you recommend another sweetener by chance (honey, coconut sugar, maple syrup, etc)? I buy the silk original almond milk from Costco (which is slightly sweetened) so perhaps that alone will bring up the sugar level? We aim for lower carb for nutrition reasons but can handle sugar in moderation. Recently found your site and am loving what I’ve made. The name is me to a T. Appreciate your time and energy!!! I am sure you could sweeten this with any of those sweeteners. Need to use a spicier sausage and add more jalapenos or even some cholula sauce to get more or a kick. Just bulk Italian. I think it was the Whole Foods 365 brand, spicy? I have yet to find a recipe I like using almond and coconut flour. I find I have to pick out the four grains out of my teeth. The texture has never been right. Hi Carolyn, I love your recipes. I’m curious, though. Why the vanilla? Thanks for your time. Because it gives it a little extra sweet flavour similar to corn. You don’t need it but it helps. I made this and it’s really really good. Had it for supper than for breakfast – ha! I used breakfast sausage and I plan to make next time with a few more seeds from the jalapeno to give it more spice! Thanks for this recipe! In the oven as I type this. I actually left out the sausage ?, just thought I’d see what it’s like plain. I snuck a taste of the batter and you nailed it! Tastes just like cornbread. Your recipes are keeping me sane on a very restricted diet, and I appreciate the quality of your recipes. Thanks so much! 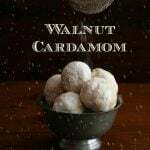 anyone try these in a muffin tin yet? I know the bake time would be different. Okay. I tried it. Got 12 muffins. Baked 350* for 20 min. That part worked. What did not work for me was the recipe itself. The coconut was a little overpowering and it was more cake-like than cornbread. This goes into my file folder called “MADE IT-LOVED IT”. In fact I just ate a warmed piece for breakfast with my coffee, although I’m sure it goes much better with soup or a salad. I will be making this again and again. The cast iron skillet works great and produces a nice brown crust. I pre-heated the skillet. I didn’t have the full 12 oz of cooked sausage on hand, but the 4 to 6 oz I had gave great flavor. I used a combo of sweet and hot Italian sausages. I also used jarred, sliced Jalapeno that I chopped in the food processor. A good substitute if you don’t have fresh peppers. A delicious, easy bread that non-low carb people will enjoy too. I don’t think you need to tweak anything, it will be a great addition! Made this tonight and it was delicious! Texture and the spicy sweetness were spot on! When I make it again, though, I will skip the vanilla. It kind of made it reminescent of vanilla cake and I don’t think it’s needed to increase the sweetness, the swerve was enough. Thanks for a great recipe! I made this for brunch this morning, topped with a poached egg. Your cornbread recipe is fabulous. My husband and I have been consistently eating Keto since 8-21-2018. 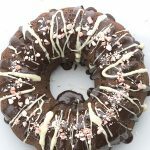 What he’s missed most while staying faithfully Keto, are my from scratch baked goods, but has stopped eating due to their negative impact on his health. He dropped 16 pounds of belly fat, I’ve dropped 6 pounds. We are 69 and 67 years young, on no prescription medications. On Keto we eat two meals day, in much smaller portions than we were accustomed to, because we don’t get hungry. Most Americans need to seriously examine why they settle for eating the processed food that is sending them into a disease state. They’d rather take a prescription drug, than eat healthy for a best life. 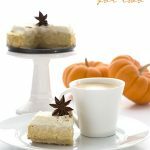 Thank you for your generosity in sharing your recipes. We prefer savory over sweet. I left out the Swerve. Next batch, I will use 1/4 cup bacon grease in place of half the butter. Our Keto journey has been fabulous due to websites like yours. Love this flavor combo! Looks so delicious! 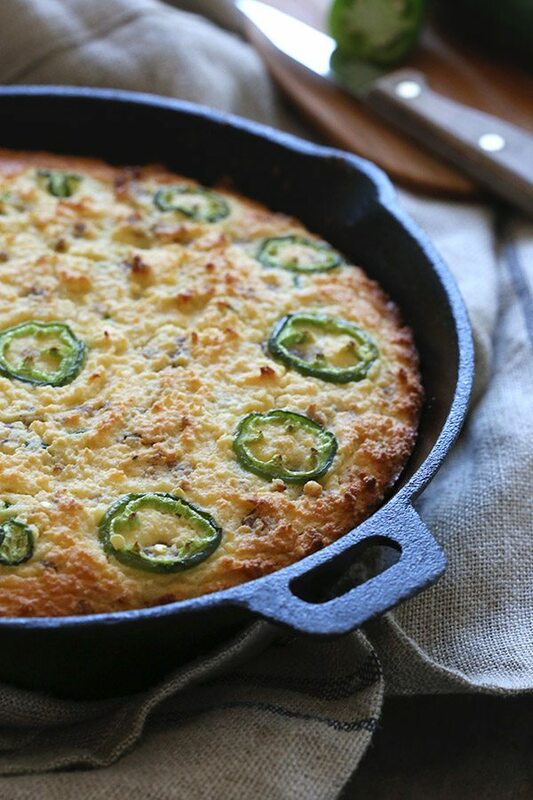 Love everything about this cornbread! Wish I had a slice right now! This would be so great to serve for Thanksgiving! 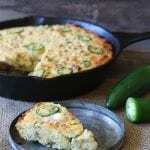 I love the addition of jalapenos to this recipe! I love that you used real ingredients in this recipe especially adding jalapeños! I love a bit of a kick!